Art lessons in our homeschool have historically been outsourced due to my profound lack of artistic ability. 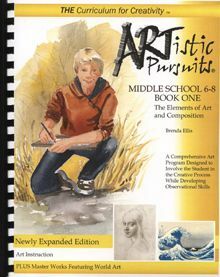 When the opportunity came to review the art curriculum Middle School 6-8, Book 1: The Elements of Art and Composition by ARTistic Pursuits, Amber and I jumped on it. Amber has such a love of artistic endeavors, yet she appears to have inherited only a small amount of her dad's natural ability. Drawing for Amber takes extreme effort and she needs detailed instructions to understand the concepts. For almost every home art project, my husband has been the one to guide and assist Amber. It was with glee and a small amount of trepidation that we opened the package with our new art curriculum. We received the plastic bound middle school book for the purpose of our review. I was surprised to find the book also has clear plastic front and back covers to protect the heavy stock paper pages inside. This curriculum, even though it mostly deals with black and white drawing, has color pages and color examples where applicable. This full year curriculum is divided into 16 units which each deal with a specific topic. Within the units are four lessons that incrementally teach the student through written instruction, example, and small practice tasks. The fourth lesson then culminates in a project that utilizes the topic covered in the unit. Every unit also contains an Art Appreciation / Art History page with cultural and art / artist information related to the unit theme. After reading the introduction to the book and the "What Parents Want to Know" page, I handed the book over to Amber and let her read the "What Students Want to Know" page as well as peruse the entire book. Amber has received drawing instruction in several previous art classes, but her knowledge was still quite spotty and her confidence low. I let her decide which units of this curriculum would be the most beneficial and interesting with which to begin. Amber chose to start with Unit 2 - Line as she felt her understanding of this concept was weak and that would hinder her throughout the rest of the curriculum. She was in a creative mood and went through the entire unit in one sitting. Even though she had used graphite pencils before, she found the instructions, with visuals, on how to achieve thin and thick lines with the pencil to be invaluable. Amber then spent quite a bit of time studying the sample project and selecting the photograph to be her drawn object. (Top/left) The final result from the Texture unit. (Top/Right) Last minute instructions before using ink. (Bottom/Left) Practicing the lesson on shading with ink. (Bottom/Right) Practice complete. In the end, Amber was quite proud of her drawing and could not wait to show her dad when he arrived home from work. She was especially pleased to have completed such a drawing without the guidance of her father or any other teacher. It was amazing to see how confident Amber was over her drawing. She to special care to explain to me and her dad the process for this project. The next unit Amber selected was on texture, since again she felt she lacked the needed skill in this area. This time Amber decided to have her dad sit with her as she worked through the lessons and the final project. While he was not needed for Amber to complete the lesson, she said it made understanding a lot easier to have him rephrase some of the instructions and demonstrate the technique. Amber's finished product shows a much better grasp of texture than she has shown in the past. Amber also completed projects in visual paths and symmetry which included the use of ink drawing that she especially enjoyed. Again Amber's dad supervised the final project part of these lessons as he also rather enjoys using ink. Amber explained to me the concept of visual paths, then showed me her project - it really did draw my eyes exactly where she had intended. I was honestly amazed at the quality of Amber's ink projects. Working on the Visual Path project - her objects were a lotion bottle, bread plate, and small glass candle. Then the finished practice and project from the unit. We weren't quite sure what to expect from the curriculum when it arrived, however it surpassed any possible notions we had. Amber found the instructions to be simple, yet clear and very much appreciated the many examples that demonstrated the process for each unit theme. Amber greatly enjoyed working on several of the lessons with her dad, yet feels confident she could have completed those lessons and projects without his help. I was happy to have found a complete curriculum that will not only instruct, encourage and give Amber confidence in the areas of art where she feels weak, but it requires so little input from an artistically impaired parent, like me. As our full-time school year is now in the final weeks, we will probably hold off on any additional art lessons until next year, but we fully intend to continue through this curriculum to its end and highly recommend it to anyone looking for home art instruction or art appreciation lessons. Please take a few moments to see what fellow members of the Review Crew thought of other ARTistic Pursuits products.